At Neutral Bay Laser & Dermatology Clinic, we offer a comprehensive range of treatments for your unwanted, unsightly leg veins. We offer both sclerotherapy and laser options to have you confident again in shorts and skirts and ready for summer. Sclerotherapy is a procedure used to treat varicose and spider veins. A liquid solution (sclerosant) is injected directly into troublesome veins, causing them to shrink. The unwanted veins close, forcing blood to reroute through healthier veins, with the unwanted vein being reabsorbed into local tissue and disappearing. Sclerotherapy has been practiced for about 100 years. The use of foamed sclerosants and ultrasound guidance being more recent developments. After sclerotherapy, treated veins tend to fade within a few weeks, although it may take a number of months to see the full results. In most instances, a series of treatments at monthly intervals may be needed. What can be treated with sclerotherapy? In ultrasound guided sclerotherapy, ultrasound is used to visualise the underlying vein, then precisely monitor the delivery of the liquid solution injection into the correct location in the vein. Ultrasound guided sclerotherapy is often used after venous abnormalities have been diagnosed with ultrasound. Sclerotherapy is a minimally invasive procedure, which is the gold standard for treatment of larger spider veins and smaller varicose veins. 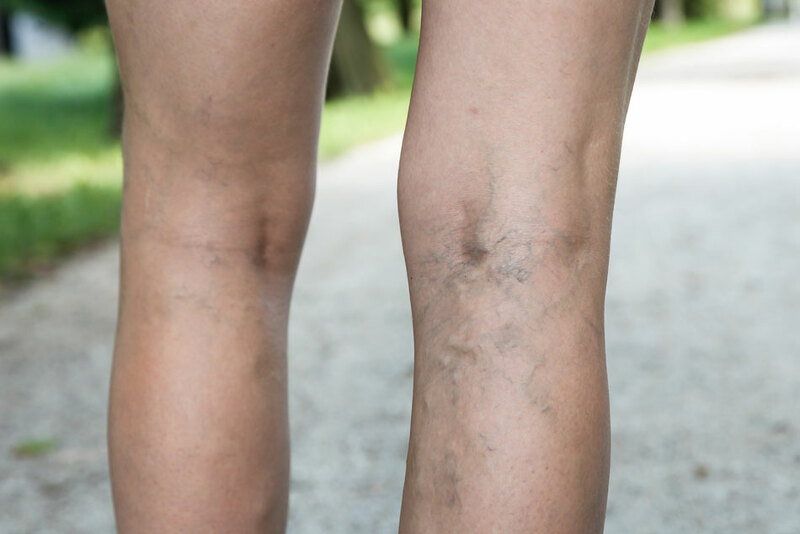 It can close the feeder veins under the skin that are causing the spider veins to form, thereby making recurrence of the spider veins in the treated area less likely. Multiple injections of the sclerosant are injected into the abnormal surface veins. The leg is then compressed with stockings which the patient wears for a week. Patients are encouraged to walk after immediately following the procedure. Sclerotherapy is a fairly safe procedure, with few complications. The majority (50% to 70%) of injected veins may be eliminated in a couple of sessions. In general, smaller veins will be gone in under a month. However, larger veins can take several months to respond. Although this procedure works for most patients, there are some patients for whom this procedure will not produce successful results. For such patients, and for those for whom sclerotherapy is not appropriate, we can also offer laser treatment for leg veins. It is the least invasive method for treatment of spider veins and no specific timing is needed (eg travel restrictions or immobilisation) and stockings are not required to be worn after the procedure, so the treatments can be performed during the warmer months. The laser used for the treatment of these leg veins is the Ellipse Nd:YAG, which uses a precisely calculated pulse of laser energy, directed exactly to the blood vessel being treated. This causes the blood inside the blood vessel to heat up, causing the walls of the vessel to collapse. These blood vessels are then reabsorbed naturally by the body’s immune system. Using this system allows the treatment of smaller vessels which are not accessible by injections. These smaller vessels may disappear immediately after treatment, while larger vessels will fade away more gradually over the next few weeks. The Ellipse leg vein treatments employ the latest cooling techniques to minimise discomfort and protect the surrounding skin, and as a result treatments are much more comfortable than with other Nd:YAG systems. Normally patients experience a little redness and swelling post treatment which usually settles within a couple of days. What can a patient expect on the day of treatment? We keep leg vein procedures safe by timing treatments appropriately for each patient. After the procedure, most people return to their normal activities on the same day, wearing their stockings for a week following treatment. We avoid treating patients with sclerotherapy in the month before or after long distance air travel, to minimise clotting risks. Side effects of treatment are usually mild, and can be managed with simple measures. They can include itching, bruising, raised red areas at injections sites, aching and pulling sensations. How do I know which leg vein treatment is right for me? If you are interested in discussing whether sclerotherapy or laser treatment is the right treatment for your leg veins, please call our clinic on (02) 9553 9522 and schedule an appointment with our Dermatologist.